Last week, I wrote about how lucky I was to have parents who weren’t afraid to talk about money in front of me. From the time I was a child, I knew that debt was bad, saving was good and budgeting was important. My parents taught me so much about money by being open with me about our financial decisions and our family’s finances, but once I became an adult, I still had to make some (really dumb) financial mistakes on my own, even though I knew better. Like most kids forging their way through life, it didn’t matter how many times my parents told me not to do something (don’t go into debt for a car! ), I was probably going to do it anyway. I had to figure things out for myself, even though most of my experiments ended in financial suffering, but that learning process was very important for me. 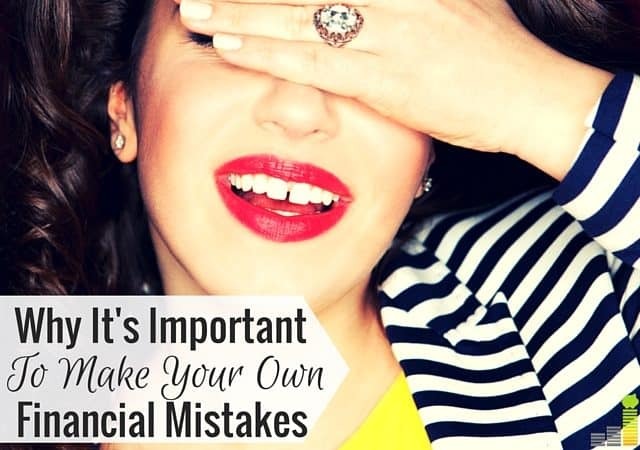 Here’s why I believe it’s important to make your own financial mistakes. A big life lesson for me was learning that no matter how hard I try, money can never buy me happiness. Buying shiny new things will give me a temporary shopping high, but it will not make me happy in the long run. In fact, the more stuff I buy, the less happy I’ll become because I’ll have lost some of the security I feel by having extra money in the bank. Living paycheck-to-paycheck for a while is something many people go through to try to finance the life they think they should have, but a life spent trying to keep up with the Joneses is exhausting and leaves you with nothing but debt and regret, and that’s a valuable lesson to learn. We all have wins and setbacks, and you can always learn new ways to be frugal, no matter how frugal you think you already are. Frugality is a work in progress, something that takes continual effort, but the end result is always worth it. I sometimes have days when I want to forget about saving money and go somewhere (preferably Target) to blow a ton of money, but then I have to reel myself in and remind myself that frugality is a daily process. Saving money through small acts of frugality is what helped me secure big victories like quitting my job to start freelancing and paying off my mortgage early. It’s also what lead me to my pursuit of minimalism and this amazingly simple life I’ve created for myself. I realized that eventually all of those little frugal victories add up to become one big financial victory, whether it’s in the form of massive debt payoff or early retirement, and that is absolutely worth living a frugal life. I’ve gotten some really great opportunities in my life since I’ve started living frugally, and I never want to go back to the way I was living before. Gaining financial knowledge through trial and error is okay as long as you’re actually learning something from it. When I got my first car loan, I was disappointed in myself afterwards for getting rid of a perfectly reliable car for something prettier. I felt silly for that decision, so I buckled down to pay off that car as fast as I could and vowed to never have another car loan again. From that experience, I learned that I hate being in debt for anything and that nothing, no matter how shiny it is, is worth that crummy feeling. I’m a smarter person because of my past financial mistakes, and that’s why I’m okay learning some things the hard way. Have you made many financial mistakes in the past? What do you wish you could go back and fix? What did you learn from it? It is comforting to know that even the most financially savvy people have made mistakes in their pasts! You are right, it is important to learn from the mistakes and apply the lessons going forward! We can’t all be Warren Buffett! Financial mistakes are what help us learn. I agree that as long as you learn from your mistakes, making them is a bit easier to take. What I have learned is that there is a better way to approach decisions (especially “big” ones!) that can help save a lot of time, money and regret. I won’t say that I always make the “perfect” decision (is there even a perfect decision? ), but I certainly feel am more satisfied about the decisions I make. My older and wiser self could have been financially independent 10 years ago had I made better decisions. 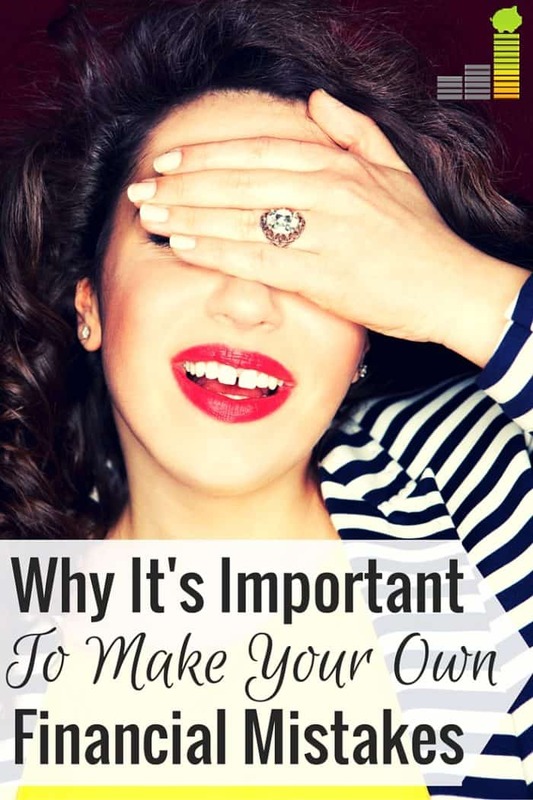 I would vote for minimizing your mistakes – and learning a better process. If we try to learn from our mistakes, we don’t have to regret them so much. Making mistakes is fine and part of life. The key is to try to avoid making the same mistakes over and over again. Yes, because then you’re clearly not learning anything. I wish that I had saved more from a young age, but I thought I had lots of time. Wrong thinking!! It’s a long time til retirement yet but I know now how important saving is. When you’re in your 20s, retirement is more like an abstraction rather than something that’s going to be here before you know it. Learning early and with few repetitions of the ‘lesson’ is key. The real first lesson is to pay attention to your finances so you are aware of mistakes when they occur. I’ve done quite some stupid things in my life, but I did learn a lot. From my mistakes and from others’ mistakes as well. I do hope our daughter will make less mistakes though, it would be a pity to repeat the blunders we once made. I feel the same way about my daughter! I know she’ll make some, but hopefully I can prevent some of the bad ones. I’m not a big fan of dwelling on the past, but reflecting on the past can be good. There will always be regrets in the past but all you can do is learn from them. I think one thing that stands out to me is the fact that a lot of people say “learn from _____’s mistake so you don’t make it.” In reality I think there is a ton of value in making your own mistakes. If I hadn’t graduated with $100k in student loans I wouldn’t have had the motivation to do all the things I’ve done on the side – and perhaps wouldn’t have been as motivated in my career, either. Sure it would have been nice to not have those student loans, but they made me who I am today. That’s a good point. Those student loans made you hustle so much harder than had you not had them…and if you didn’t have them, who knows if you would’ve built such a successful website and then had a book deal. Pretty positive way to look at it, DC! Learning from your own experience is often the best way to learn. When you’re young it’s hard to listen to lectures from those with more experience telling how to do something and what to do. You’ll always think that you know it all. But if you experience it yourself, you will never forget those lessons. I used to love chasing hot stocks and got burned one too many times…now I stick to investing in index funds. I definitely used to think I knew it all when I was young… and then I went out and made a lot of mistakes. Nice title. Making mistakes is not bad. It’s part of life. The key is to try to avoid making the same mistakes over and over again.